1749 Vaugondy Map of West Africa. WE SELL ONLY ORIGINAL ANTIQUE MAPS - NOT REPRODUCTIONS. Title: Partie Orientale de la Haute Guinee. Robert de Vaugondy Fils de Mr. Description: This is a hand colored 1749 Didier Robert de Vaugondy map of West Africa. 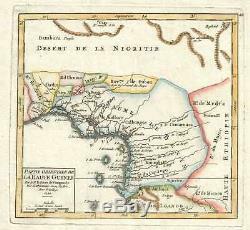 The map depicts from the Royaume de Juida to Haute Ethiopie and from the Desert de la Nigritie to the Royaume de Loango , or, in modern terms, from Togo and Niger to the Central African Republic and from Niger to the Republic of the Congo and Cameroon. Numerous other kingdoms (royaumes) are illustrated. Myriad rivers are depicted, along with several towns. A handful of islands are depicted into the Gulf of Guinea. This map was published by Gilles Robert de Vaugondy in his Atlas Universel, Portatif et Militaire in the 1749 edition. Size: Printed area measures 6.5 inches high by 7 inches wide. If your address is a P. Duty varies by country and we cannot predict the amount you will be charged. Some countries are duty free, others are not. Other Services Conservation Framing: Geographicus recommends basic conservation framing services for any antique paper. We do not offer this service. Antique Map Restoration: Geographicus can repair and restore your antique map. Services include deacidification cleaning flattening and backing. The item "1749 Vaugondy Map of West Africa" is in sale since Thursday, March 14, 2019. This item is in the category "Antiques\Maps, Atlases & Globes\Africa Maps". The seller is "geographicusmaps" and is located in 11221. This item can be shipped worldwide.